These non-stick molds make it easy to bake uniform fat-free taco bowls. These custard cups are perfect for prepping taco bar toppings ahead. Put on the lid and stack in the fridge until serving time. This is a crowd pleasing menu that will get you raves every time. It's versatile, fun, and most of it can be prepared in advance. 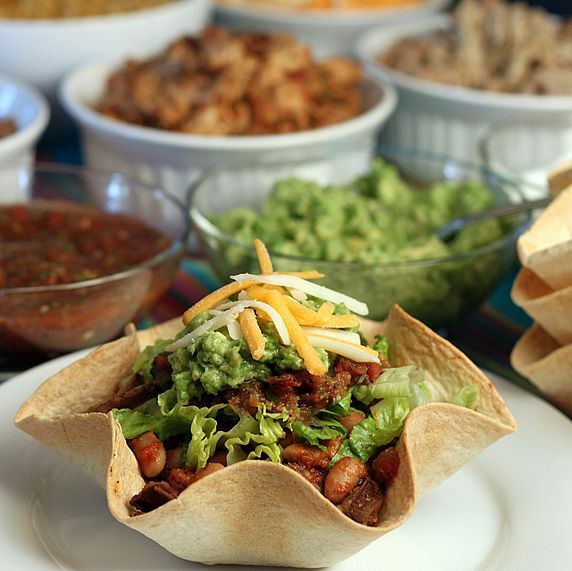 Bake tortilla bowls and prepare toppings of your choice. 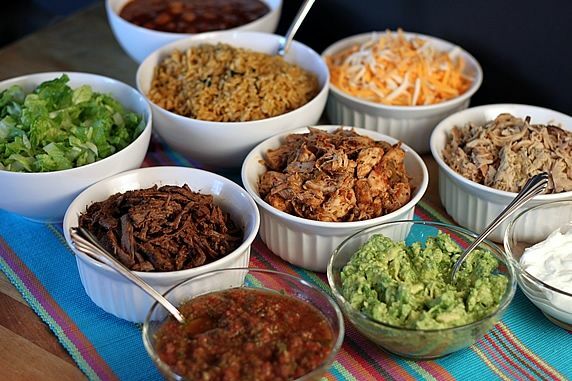 Put toppings in separate bowls, and arrange them in a logical order for filling tortilla bowls. 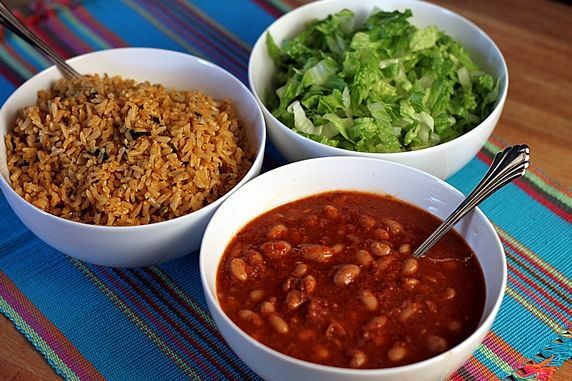 Suggested order: start with rice in the bottom of tortilla bowl followed by meat, beans, & lettuce. Then add sauces—salsa, sour cream, guacamole. Sprinkle on any other options (chopped onions, cilantro, olives, etc.) and top with cheese. If you want the cheese to melt, add it earlier between the heated meat and beans. *recipes available at www.TheYummyLife.com in the recipe index, see International-Mexican category. I recently served these taco bowls at some large buffet dinner parties, as explained in a previous post. This is a fun way to feed a large group. Guests fill their own tortilla shells with a variety of topping choices, making it easy to customize each one for individual preferences (vegetarian, spicy or not, etc.). But, this menu isn't just for big parties. It can also be a fun family dinner. In fact, King-Man and I often have these for just the two of us, although I'm less ambitious about the topping options when I'm making these for 2. 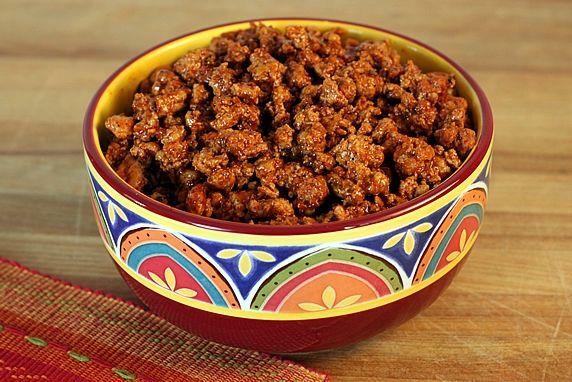 Today, I'm going to offer suggestions for assembling your own ingredients for a Tortilla Bowl Taco Bar. There are many options, and you can pick and choose the ones that appeal to you. Tortilla bowls. 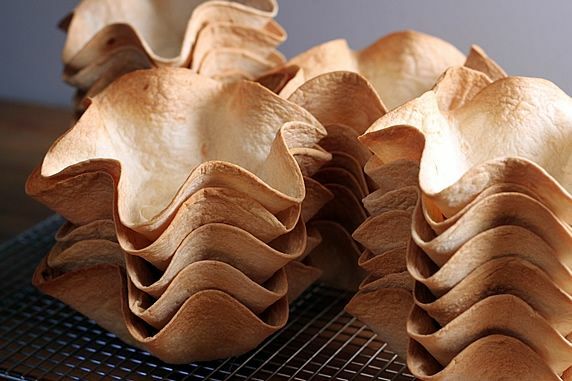 First you need to bake tortilla bowls. It's so easy, and is explained in detail in my previous post. 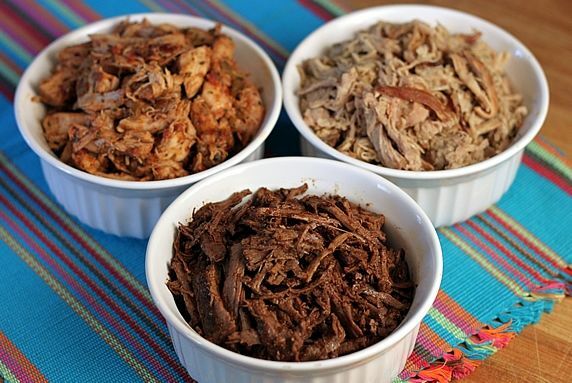 You can prepare just one type of meat, or make several. 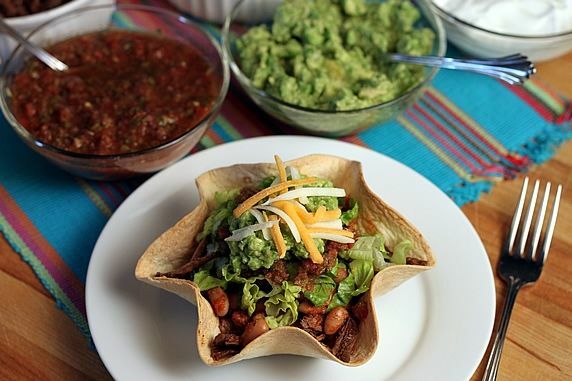 Here are 4 options--all are delicious in these tortilla taco bowls. 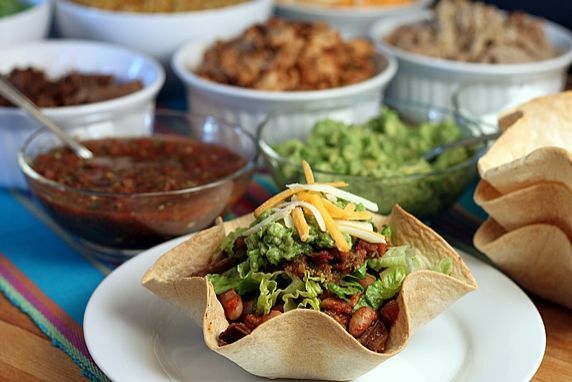 Put all of your topping choices in individual bowls and let everyone fill their own tortilla bowl. If you're serving this buffet style, arrange the topping choices in a logical order for filling the bowl. Here's a suggested order for filling the bowl: start with rice in the bottom of the tortilla bowl followed by meat, beans, & lettuce. Then add sauces—salsa, sour cream, guacamole. Sprinkle on any other options (chopped onions, cilantro, olives, etc.) and top with cheese. If you want the cheese to melt, add it earlier between the heated meat and beans. 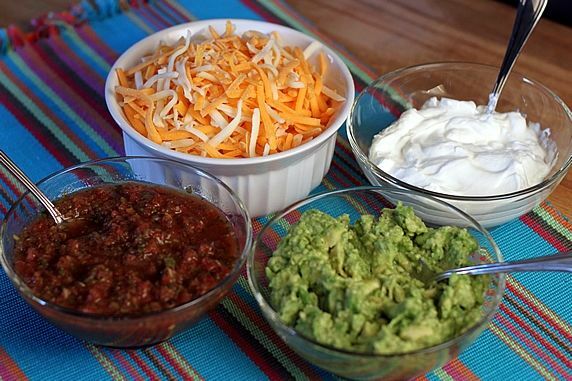 Make ahead tip: Most of these toppings can be prepared in advance, so all you have to do is heat a few items and put everything in bowls right before serving time. The meats, beans, and rice all freeze well, too. The salsa can be made several days ahead, and the tortilla bowls can be made the day before. Not only do these taste fantastic, but they are also fun to eat. 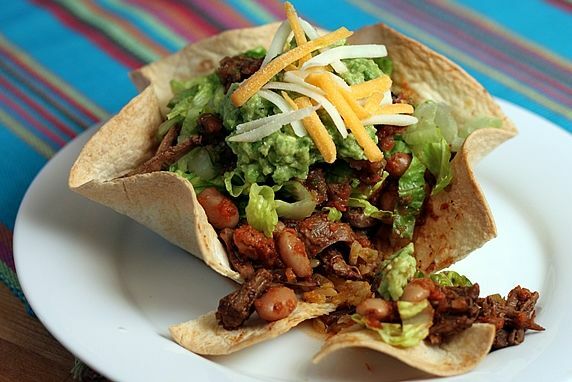 Break off pieces of the tortilla bowl to eat as you go. That is one good lookin' bite right there. 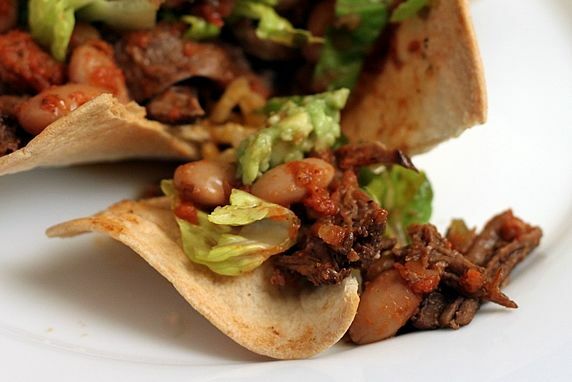 for serving these tortilla bowl tacos at a big dinner party. Make it a yummy day! ¡Ole!